We offer FREE, hands-on training. Everything is live support! While we will share ideas for video links, podcasts, or books to read — our focus is on your individual business needs. We meet once a month in person, offer live hangouts to answer questions, and also offer weekly Mastermind groups. It’s all about spreading that Hoosier attitude throughout the Circle City of Indianapolis! If you’ve ever considered working from home using ecommerce to create income, Amazon is the platform to be on. If making money online attracts you, being your own boss attracts you, then consider joining our group. This is not one of our Entrepreneur members, but this video gives you an example of what might happen to you. The fashion design industry is not an easy niche to crack and Amazon helped her do it! Yes, we are advanced sellers. Yes, you may feel overwhelmed at your first meeting! But, we tell people that it’s like taking a foreign language — every time you attend, it gets easier and easier. We are patient and RARELY offer something for sale at a meeting. Come learn the truth about how to be a success on the Amazon selling platform. Grow and expand by going beyond Amazon, hiring Virtual Assistants, or selling on other platforms. 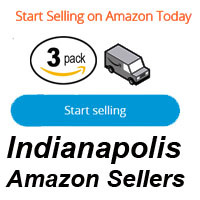 NOTE: Amazon Sellers Indianapolis is not endorsed by Amazon.com but an experienced group of individuals that participate in the programs offered through the Amazon selling platform. You will find associate links to Amazon products on this website, which is just one example of how to make money using one of their pathways to income.